When was the last time you went on a diet and lost all the weight you planned, but gained it all back (and more) not too long after? For some of us, dieting isn’t the whole problem. I mean, we all (should) know what to eat, what’s healthy and what will pack on a few pounds. We know that exercise plays an important role in the maintenance part of any weight loss success, but our diet plays the majority of the part. Our weight loss failures are usually a result of our bodies needing less calories, but our cravings for food (that we are probably cutting out completely) get in the way. 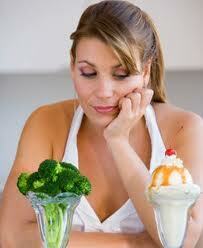 Depriving yourself will not get you far, because you’ll just end up eating more and binging in the end. There’s no way I could ever live without ever eating a bowl of ice cream, cookies or pizza – it’s just not going to happen. We have to put the “quick fix diet” mentality aside and start sticking to a healthy balance of exercise and nutrition that is realistic for us individually. If you’ve tried and failed to lose weight in the past, that’s okay (just not from here on out :)). I’m going to share with you all the tools I know, have learned and been through myself to prove to you that it can and will work for you. This will be the last time you’ll ever have to worry about gaining your weight back – ever again! The first step is critical. You need to know exactly how many calories you need to consume every day to start losing weight this week. Click here to find out now, then post this number up on your fridge. This is YOUR goal number! I want you to ingrain it in your head. For now, you’re not allowed to consume any more calories than this number figure. Your plate needs to be filled with whole, unprocessed foods like lean meats, fresh vegetables, complex carbohydrates and whole grains. Snacks should include things like fruit, berries, nuts, low-fat/plain Greek yogurt, etc. Knowing your number is the first step in losing weight and keeping it off for good. Every week, sit down and write out some new, challenging (but obtainable) goals – both with your diet and exercise. Make sure they are specific– like jogging for half a mile longer, or cutting back on two sodas. Rather than saying, “I’m going to run farther next week” or, “I’m going to drink less soda,” say “I’m going to run an extra half a mile daily” or “I’m going to cut my soda consumption down to 1 can per day.” Remember, nothing that seems like work is ever fun, so get excited about what you’re planning on achieving. Once you start seeing results (along with everyone else) and having more energy, that’s when the real motivation sets in. Go into every workout knowing that when you are done, you’re going to feel better at night knowing you did something instead of knowing you didn’t. One of the most important rules in maintaining your weight loss and keeping it off is to start off slow. You didn’t put on 30 pounds in two weeks, so you’re not going to lose it two weeks either. You’ve been gaining weight over time, every day, for months or even years on end. Taking a pound or two off at a time (usually in a weeks span) is the healthiest, most effective way to not crash and burn. Start off by slowly decreasing your calories each week, until you get to your goal number. If you’re used to eating 5,000 calories a day and your goal is to be consuming 2,300 calories, that’s a dramatic drop and may leave you always feeling hungry. Cut out 400 calories a day, then 600 calories a day the following week, etc. until you get down to consistently consuming 2,300 calories without feeling deprived. Slow and steady really does win the race. Always eat breakfast to keep your blood sugar from dropping too low. Drink plenty of water throughout the day to fight off fatigue and suppress hunger. Always watch your portion sizes, especially when dining out and at buffets. Eat lots of vegetables. They are loaded with fiber to keep you fuller longer. Choose complex carbs and cut down on them as the day goes on. Do not eat 3 hours before you plan on going to bed. If you do get hungry choose nuts or protein sources. When it comes to exercise, have fun and do what you enjoy. Ask for dressing and sauces on the side when dining out. If vegetables have butter or salt, order them dry. Supplement with whey protein, green tea, CLA, a multi vitamin and fish oil to fill in the gaps where your diet may lack. Don’t get hung up with the number on the scale. Water weight can fluctuate 3 to 6 pounds throughout the day. Know the people, places and things that can trigger overeating. I’ve had every dysfunctional eating pattern under the sun: over eating ’til I can’t breathe, mindlessly eating in front of the t.v., emotional eating, restrictive eating and binge eating – just to name a few. 🙂 My triggers were late at night around 10pm, when I was emotionally drained, and when I started eating sugar or carbs. I was well aware of my triggers, but in the moment it was so hard to not reach for something comforting like food. Knowing what really gets you going (in the wrong direction) is a huge breakthrough when you really sit down and look at all the patterns of when you failed the most. Realizing these triggers and putting a plan of action into place when they happen can be what really leaps you over the weight loss hurdle. When a trigger strikes, take a bath, phone a friend, do your nails or clean the house like I do. One last thing – if you are someone who could share a secret, please do not hesitate to add it below in the comment section! Share away and comment below!